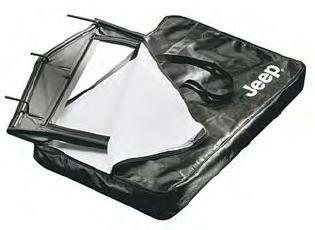 Jeep Wrangler Soft Top Window Storage Bags are available to keep your windows organized and protected. The perfect place to store you windows. Window Storage Bag, Black vinyl, 5 separate compartments, with Jeep logo. SWB or LWB Models. Please select model above. The item has a place for your 2 door windows, and a separate compartment for each soft window. I just put a brand new top and door windows on my 2005 Rocky Mountain Edition Wrangler, and I want to protect them. This is the perfect solution and avoids me having to roll them up to store them. Most storage solutions require you to roll the windows up, and this causes great damage.